My first major 2012 challenge has been met. I went to my Tae Kwon Do tournament and survived! I spoke to so many people at the event who told me they wished they’d had the guts to compete, but they were just too scared. It made me realize there are so many aspects of our lives which are scary, but if we don’t conquer our fears, we’ll miss some of the most incredible experiences there are. For me, competing in this tournament meant getting up in front of a group of judges, being in front of hundreds of people in the stands and competing in forms and sparring against people with far more experience than I have. I may have placed 5th (out of 6 people) in forms, but guess what? I landed all my jumps, I remembered the entire thing, I did my best and I even got a “thanks for participating medal!” It’s the little things. 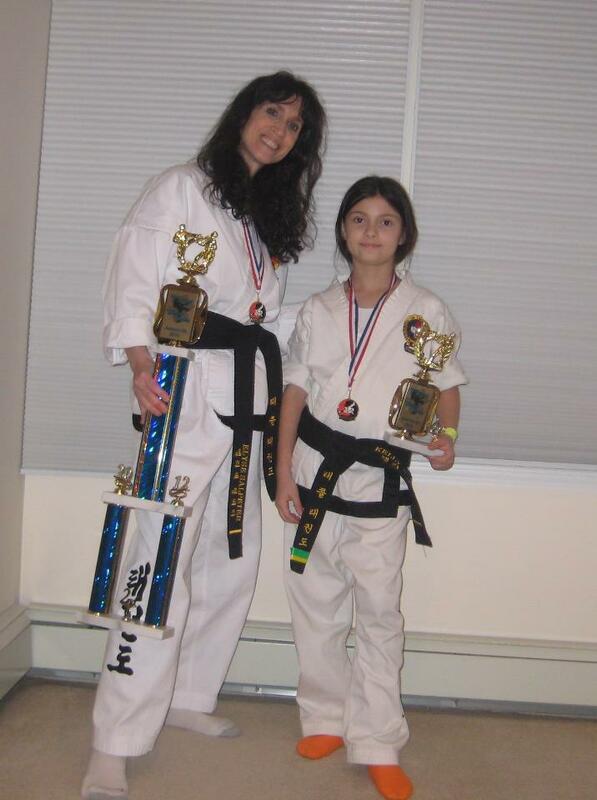 In sparring, I was up against a woman who I have sparred in my class – a black belt who is extremely good. I’ve never been able to land a punch on her in class, but guess what? I was able to hold my own in the ring and got some points and I’m super happy. I didn’t win, but I did get this cool trophy! Again, it’s the little things and I did it and I just may compete again one day. So, what’s in store that scares me next for 2012? Well, author discussions on my book. I have one coming up in my daughter’s class in just two days and I’m supposed to talk about the editing process, how long and hard I had to work to get this book published, etc… they’re going to have a Q&A and I’ve heard 10 year olds can be brutal, so I’m a little nervous. Then comes a much larger venue at the local library on February 29th. I do presentations and group meetings for my day job all the time, but when it’s a personal effort, it’s somehow tougher. But, I’m sure when it’s done I’ll be better for the experience. I used to think “grand scale.” My life would fit into compartments of success… we’d have a house, cars, the kids would be in this class, this sport, have these many friends, fit into this group, everyone excelling in everything. But reality is that life should be about the little things. For me, knowing my son had a great day at school, knowing my daughter stood up to a bully and feels great about herself, knowing I’m providing for my family the best way I know how. Adding all the little things up makes that “grand scale” map so much richer. Life might not be exactly how I pictured it would be, but it’s our lives and we should relish each aspect of it. So, I’ve decided to live with the little things, one step at a time, one attempt at a time. So please, tell my YOUR next step – I’d love to hear! We always talk about all the things we want to do when the New Year hits. All the goals we have. I can’t tell you how many times I’ve already heard how much people “want to wash the last year away.” Life can be stressful and it can be taxing and yes, there are moments when we want to simply move forwards in time to erase the past. But that simply means we end up moving through life so quickly we don’t have a chance to see the good “in the now.” People always say, “when your kids are older you’ll get more time to yourself.” Or “when they mature, things will be easier.” I never really wanted my kids to be older than they were at this very moment. I mean, yes, I’d love for life to be easier, I’d love for more personal time, I’d love the ability to write this blog without at least three people coming in to discuss things with me. Even with the door shut. Even with me saying, “can I have five minutes?” It just doesn’t compute for folks around here. But, there’s good in that. The kids want to be with me and I do relish it. I have to remember I’m not going to get these moments back, so I must constantly remind myself there will be times I can’t do my own personal goals. That doesn’t mean I’m a martyr, but it does mean I made a choice. So I write when they’re asleep, I take classes when it’s very late in the day or early in the morning, I sit down on the floor and do a puzzle, play a game and simply listen to my kids when they want to discuss things with me, because I won’t get that moment back. And I don’t want to look back on life wishing I was given that one moment and blew it. But, I’m not perfect, so there are times I do blow it, but I try to apologize and teach my kids I’m still human. It’s sort of funny. After a trying day with the kids, it might be ten o’clock at night, my husband and I are wiped, he’s on the television, I’m on the laptop and we’ll be so stressed we’ll start talking about ordering sushi. For some reason in my household, sushi has a way of making all the bad things go away. Or, keeps them at bay for just a bit. So I leave you all with a few thoughts. Do make personal goals for yourself. They are so important to your spiritual soul and well-being. These goals will help guide you and keep you growing as a person. Just make a bucket list, just a few simple, or not so simple, goals you want to achieve and even if you can’t do all of them, try to take one off the list every now and again and you’ll feel like you accomplished something. Number two, don’t feel guilty for things beyond your control. You can only take responsibility for you and your immediate family and so do your best to keep yourself both mentally and physically healthy so you can take on whatever the world throws your way. And three, a few spicy tuna rolls, some ikura and salmon go a long way when you’re stressed. Trust me, I know. Happy New Year, everyone – health, prosperity and most of all, happiness to you all!